Gergeti Trinity church, a local icon clinging to the edge of a steep cliff. 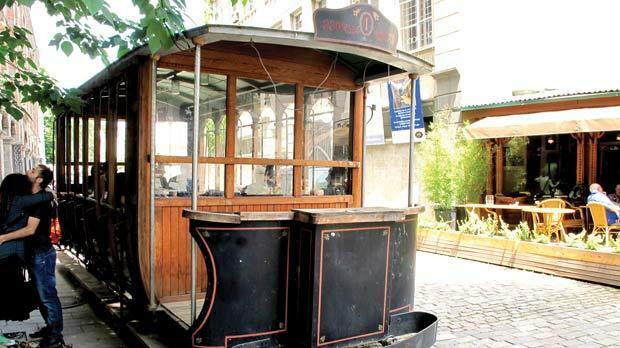 An old tram car in Tbilisi offers a unique venue for picnics and dates. The mountains are snow-capped all year round. A cross adorns lush countryside. 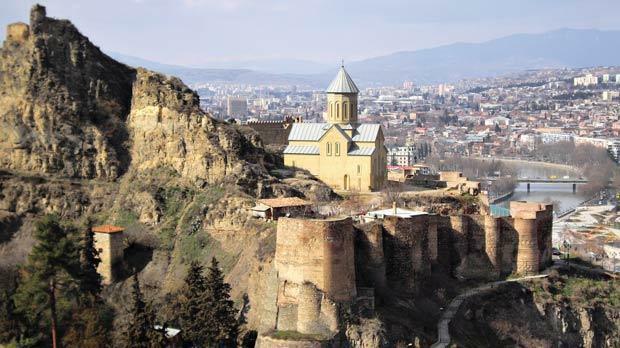 The medieval castle of Narikala overlooks Tbilisi. A man once told me that Georgia was named after St George. The marauding 3rd century dragon slayer? That patron saint of both England and Malta? A man whose history and legend defines ambiguousness? It got me thinking, and made me realise that the words I associated with Georgia were as equivocal as those linked to George: Soviet, European, bordering Asia, religious. So, staring at the magnificent bronzed George, 20 metres high in Tbilisi’s Freedom Square, I begin my quest to make sense of these words. My first day suggests that my search to untangle Georgia will be tricky. The Georgian tourism board proudly declares that this is “where Europe begins.” At many times the capital feels like a typical European city. But bizarre and unfathomable happenings unfurl around me: an old man pulls a live sheep from the boot of his two-door Lada Niva; 50 litres of homebrewed vodka are delivered to a 60-year-old woman with a walking frame, and beef burgers are sold for breakfast. I walk through lethargic streets, past tired, disintegrating buildings, to forgotten churches on the outskirts of town. 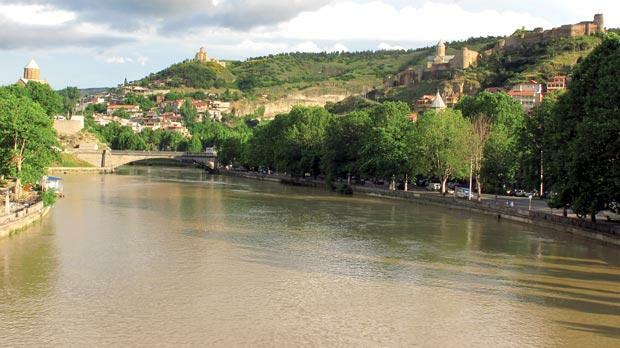 Tbilisi is quaint but languid; the sort of place an airline magazine would gush about and incessantly describe as “nice” and “lovely”. The city’s charm is not indelible, as a fraught transition is taking place from the increasingly antediluvian old to a brazenly incongruous new – a space age bridge overlooks ancient churches, old men play backgammon against the backdrop of a five-star hotel, hunched women sit at the roadside with mournful expressions, selling fruit while being ignored by modern city life. To learn more I need a history lesson. Nearby Gori is the birthplace of Joseph Stalin and his hometown museum provides an insight into what life must have been like constantly exposed to the propaganda of the regime. This Stalin fellow was an incredibly warm and honest man who dedicated himself to improving the lives of all people in the Soviet republic... apparently. And even whispering the words “penal labour camps” and “tyranny” evokes a hushed glare from security. Stalin’s sphere of influence has been as wide ranging as St George’s and on the one hand locals seem almost embarrassed that the infamous Soviet leader descended from their lands. However, Russian is still very much the second language and the English language and Latin script are almost alien concepts. I spend some time admiring beautiful Georgian curves but soon give up on their baffling script and walk around the bus station shouting “mountains”. There’s something incredibly cathartic about riding a bike through the mountains. Downhill to the Russian border, through tunnels, rain splashing of my forearms, past glacial waterfalls spurting from the mountainside, the scenery invariable but seemingly developing a dreary edge due to my preconceptions of Russia. Pause to photograph the quiet border crossing under the daydreaming eye of a bored guard who ignores my questions about St George. Then uphill, the sun out, climbing, legs burning, until a tiny village where nobody understands my gesticulations of a man on horseback stabbing a mythical creature. Rest. Pull out the picnic and enjoy the panoramic of 4,000-metre-plus mountains, their peaks iridescent under intense solar rays. And downhill once more, flying over bumps, playing chicken with the breaks, then the dreaded hissing sound, and you can fit a sheep in the back of a Lada Niva but not a sorry bike with a flat tyre, and it’s another 16 kilometres to the homestay. It’s almost dusk when I stagger back to Nazi and her family home in Kazbegi, a small village in the Khevi province three hours north of Tbilisi. Accommodation in Georgia is in its infancy, and budget and mid-range options come in the form of homestays. Rather than being an inconvenience, they provide relaxed and informal opportunities to experience life in the home of local people; typically with the families of chunky retired women who like to fuss over everyone all day. Nazi’s table is bursting with roasted chicken, vine leaves stuffed with rice and mince, fried aubergine, an inordinately sweet white wine: all a wonderful tonic for my weary, sweat-stained body. Throughout the evening more people arrive with wine and vodka and never-ending toasts to Georgia, to women, to Nazi, to mountains, and so on into the night. 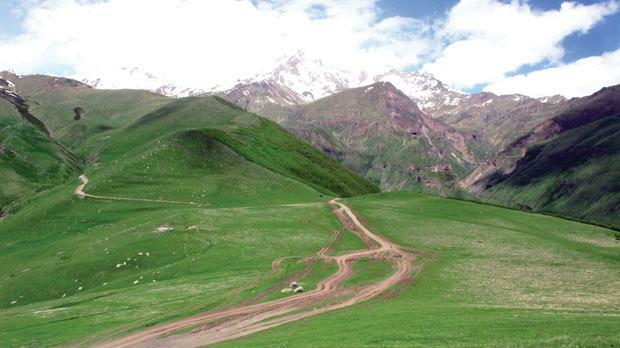 The following morning I set off on foot towards Mount Kazbegi. 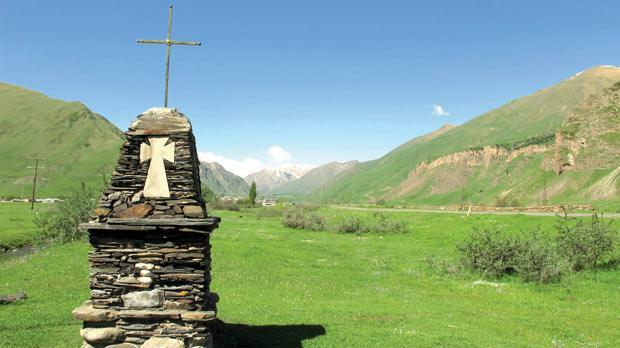 Six-and-a-half kilometres uphill from the town is the Gergeti Trinity church, a local icon clinging to the edge of a steep cliff. Incense burns inside the shadowy edifice, creating a poignant atmosphere intensified by the unfathomable sounds of the priest who warbles with his back to the small congregation. 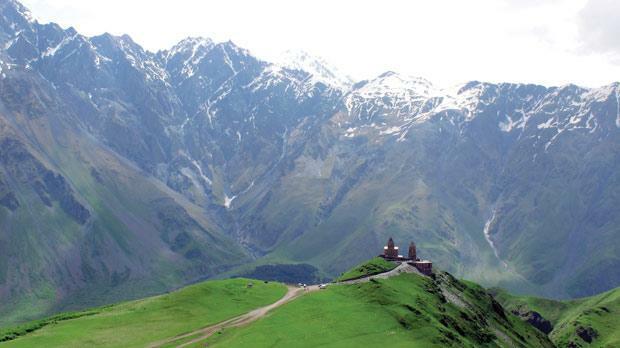 In the 1980s, Kazbegi was a popular domestic holiday destination and the Soviet authorities built a cable car line from the town to the church. The ecclesiastical locals felt it denigrated their special holy place and promptly vandalised the project, destroying everything in a courageous show of defiance. With my head focused on the 5,051-metre peak I continue uphill, crossing the path of moseying cows as the incline intensifies. Ice and snow becomes more frequent until I reach the plateau, a meeting point of 99 separate glaciers, a silent location to wolf down Nazi’s lunchbox. From my vantage point there is an almost 360˚ panoramic of snow and white summits. Buoyed by my progress, I sloppily descend onto the glacier, determined to cross and reach the barely visible meteorological station, an additional 800-metre gain in altitude. Footprints in the ice give a vague indication of the path; each dug a foot below the surface. But the storm clouds open, releasing a vague frosty rain that descends and engulfs everything, reducing my visibility to the ten metres in front of me. Suddenly my foot falls underneath me, losing itself in the snow. Attempting to pull myself out my left leg follows a similar path. This is Europe in June, less than three hours from a capital city, and I’m buried waist deep in snow. I decide the safest course of action is not to move, and waiting for assistance helps elucidate my opinions on Georgia. This isn’t a country of East meets West clichés, pseudo European imitations or Soviet relics. It’s a tiny and distinctive nation, as inimitable as they come; one that blends beauty, absurdity, and randomness in a way that’s unambiguously Georgian. On the surface it appears relatively normal, but you can be sure that something surprising is either around the corner or in your peripheral vision. A group of three climbers cross my path and haul me to safety. They’ve clearly done their research. Georgia, they tell me, was initially derived from a Persian word for the heroic people in a territory. Which is apt. Because, despite the powerful influences that surround it, Georgia has done courageously well to preserve such a unique identity.